Just to remind beekeepers everywhere to check their bees for stores as we are coming into a high risk time for starvation as the queen gets into gear and the remaining winter stores are used up. So give your hives a heft and if needed, give them some fondant or candy (not liquid feed!). The BBC report that sightings of the honey bee-killing Asian hornet have been confirmed in Cornwall and East Yorkshire. Work is under way to identify any nests in Liskeard and Hull, the Department for Environment, Food and Rural Affairs (Defra) said. The Asian hornet is smaller than the native hornet and poses no risk to human health, but does pose a risk to honey bees. Inspectors are monitoring areas around the sightings. Wasps are making their appearance felt now around the hives. Reduce the entrance size of the hive, probably opened fully during the recent hot weather, to give the bees a smaller area to defend. 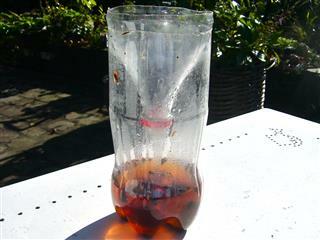 Put out wasp traps, these can be bought or easily made with a jam jar with a hole made in the lid or from a plastic drinks bottle as shown. Jam attracts wasps, but not bees. Do not use honey in the bait of course. Be tidy and keep rubbish away from the apiary, which could attract wasps and other pests! Just to remind all beekeepers that the June gap can still happen and inclement weather, combined with large growing colonies and little or no available forage, can quickly result in a shortage of stores. So be sure to check that your bees have enough food, especially if you have taken off any spring honey. Note that if you add extra frames of sealed stores you should keep them in the brood boxes, so as to avoid getting them mixed up in the honey supers. Also, if you have to feed directly, use a light syrup (i.e. 1:1 sugar/water ratio) with any honey supers taken off during the feeding process.